OK, that's not actually quite true. 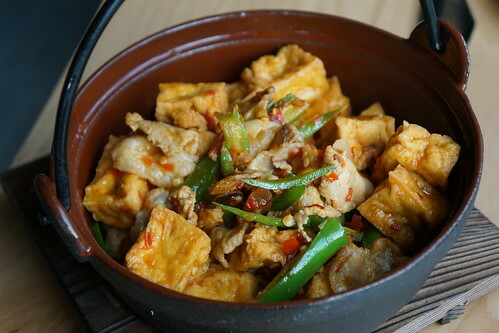 Szechuan Impression, which serves more of a "modern" take of Szechuan food compared to Chengdu Taste, is actually not as spicy as Chengdu. 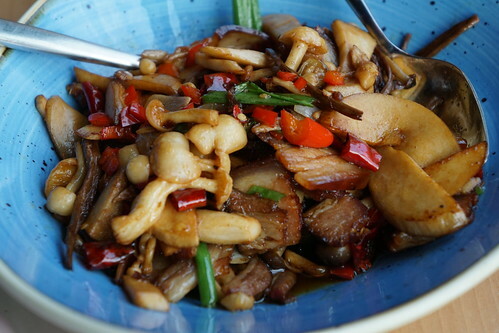 The main question on everyone's tongue is: Is it better than Chengdu Taste? The short answer is that they are each better than the other on different dishes! I thought it had a lot more flavor than the one at Chengdu. It's also not overly spicy while still having that numbing effect and bold kick. 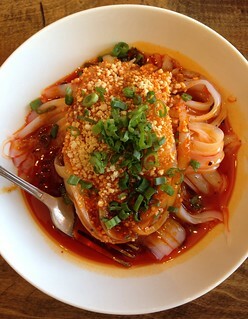 The slippery noodles have a cooling effect that tempers the spiciness for me. 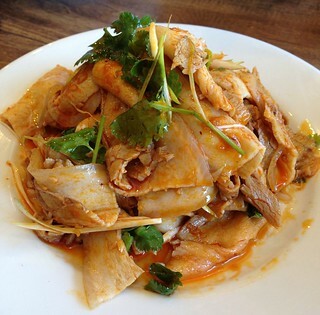 This spicy, garlicky slices of fatty pork were very addictive! I would come back for this dish and the jelly, for sure. When relatives come to visit, I inevitably end up at a Chinese restaurant. At least once. It happened twice this time, and one of the two was at Boston's popular Chinatown joint, Gourmet Dumpling House. 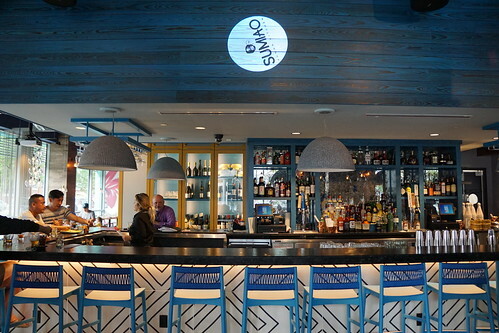 This place was named as having the best XLB aka xiao long bao aka juicy dumplings in Boston. The dumplings were pretty good. They're on the bigger side and the skin is thicker and not as delicate as Din Tai Fung, but the inside is juicy. It's more of a rustic style, you can say. 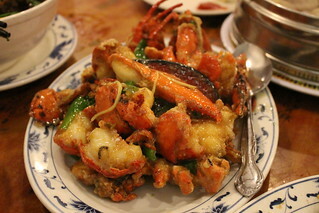 During lobster season, you'll also find lobsters for pretty cheap here. I received an invitation to check out their new location on Pier Avenue in Hermosa Beach, just steps from the Hermosa Beach Strand. 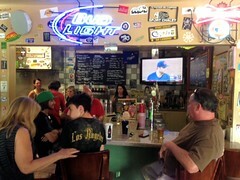 The longtime resident of that location was Cantina Real and the present owners retained the front patio. The inside, however, has been beautifully transformed. Large windows were installed, two skylights were cleared and the restaurant is filled with a lot of natural light. 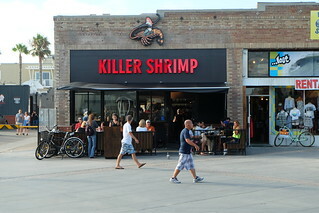 In addition, Killer Shrimp also offers unobstructed views of the Hermosa Beach Pier and the ocean. Killer Shrimp has an interesting history. Owner Kevin Michael’s father is musician Lee Michaels. 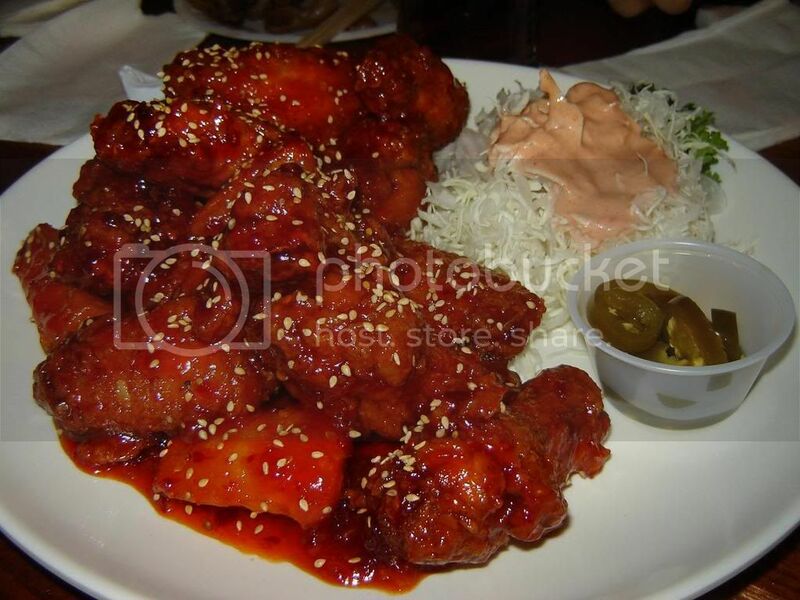 Growing up in Venice, Lee perfected the sauce which later became their “Killer Shrimp’. They served their shrimp dish to friends and neighbors who thought that they had something special. Lee’s sons were soon seen peppering the neighborhood with flyers and were delivering up to 40 meals per evening. Some of LA’s tastiest burgers come from the most random, tiny, oblivious places strewn all around town from South Bay to San Gabriel Valley to East LA to North Hollywood. For me, I always have higher appreciation of food served from push carts on street corners or alleyway storefronts rather than bright vibrant storefronts marred by eccentric tourists on Hollywood Blvd. First off, I just wanted to say how excited I am to find this hidden gem, Tee's on the Green, in Tujunga. I gave full credit to owner Tiffany Casper - not only for inviting me but also for flexing her muscles to craft the perfect burger that made haute burger joints seem amateur by comparison. I mean, if you’re like me and spend lots of time around the 210 Foothill Freeway/ La Tuna Canyon Park either for hiking or just to pass the highway, you’d understand my untethered delight in finding this place. 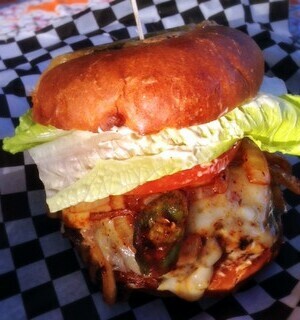 During my visit here, I had the chance to devour their Hot Mama Burger with a side of zucchini fries/ onion rings. In anticipation of the Chowzter Global Awards in London this week, I thought I'd blog about the lunch I had with them in San Francisco (where Langer's #19 won the Tastiest Fast Feast for North America). Our big group went over to the recently popular Mission Chinese Food - too early, they haven't even opened yet when we arrived. Being bloggers, we just took photos outside and studied the menu until they open. 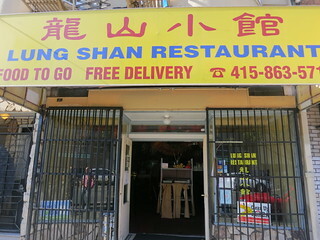 Mission Chinese had taken over the Lung Shan space, where they used to do pop ups, and they left the old sign. 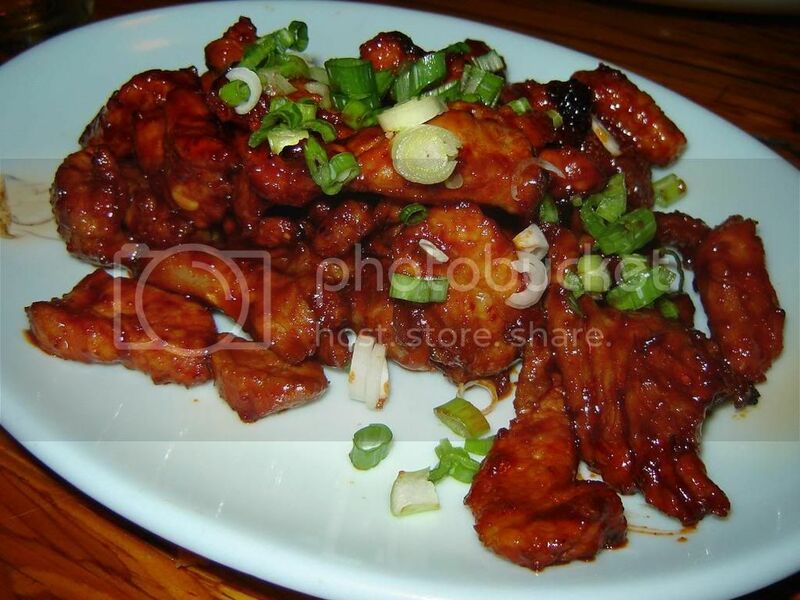 The crispy chicken wings were buried in peppers! As good as they were, the most surprising and addictive component of the dish was the crunchy tripe slices scattered at the bottom. 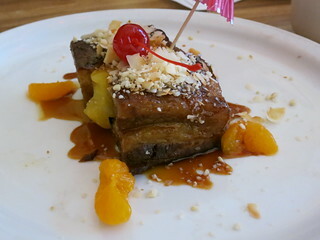 You can take a break from all the spiciness and tingly feeling the chicken wings left you with dishes like Tiki Pork Belly (in soy caramel, mandarin, pickled pineapple, shaved coconut, macadamia nuts - $10). And a tiki umbrella, natch. As Eating LA said when we were eating at Ashirwad, the best Indian restaurant in Los Angeles is actually not in LA - it's in Upland! On our latest food crawl, after Taza and Falafel Me, Food GPS led us to this place, following a tip he got from someone he met on an airplane. The khasta kachori is a puri (crispy pastry) stuffed with potatoes, roasted spices, topped with onion, cilantro, yogurt, and a sweet and sour (and spicy) sauce made of tamarind, jaggery, and cumin. 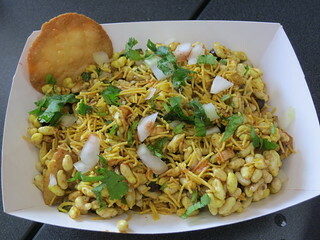 There's also Bhel Puri ($3.99) consisting of puffed rice, papadi (small, deep fried puris), sev, onion, potatoes and sweet and sour chutney. Both of the dishes above were crunchy, sweet, sour, and spicy at once. They pack a lot of strong and unusual flavors. 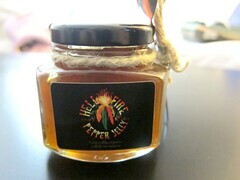 Product Review: Hell Fire Pepper Jelly, Aptly Named! 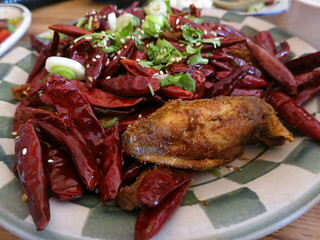 I'm not one to try the ghost pepper, or enjoy the incredibly spicy dry curry at Jitlada. Basically, I can't really handle spicy food (although I'm getting much better). Still, when they offered a sample of the Hell Fire Pepper Jelly, I was curious. Yes, I'd love to try it! I've had jalapeno jam before and it wasn't all that spicy. The small jar came with a cute little spoon. The golden color looks unassuming. It smells both spicy and sweet - hard to tell which way the taste will lean but it smells good. I didn't have any bread at home, so I went over to Wandering Chopsticks' house and for the first taste spread it over white bread, took a bite ... sweet, a little touch of tartness, .. then it creeps up on me: oh my god, SPICY! Hell Fire indeed! 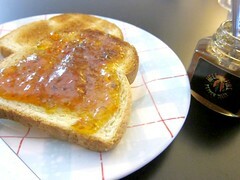 This was no jalapeno jam I randomly tried years ago, this thing is the real deal! Now, white bread is probably not the best way to eat this. WC suggested this would be a good dipping sauce for meat. Perhaps glaze for barbecued meat? Yes, I think that would work very well with this. It already has the flavor components of a sweet BBQ sauce, with a super kick. Bottom line: if you like spicy and want to try something different, this one is for you. Disclaimer #1: I can't really eat spicy foods and don't normally eat spicy (that is to say, I'm no authority on anything spicy -- if I am on anything at all). Disclaimer #2: I tried these dumplings in chili sauce at YunChuan garden after Kat's disclaimer that she can't really eat spicy yet she loves these dumplings. I now also loove these dumplings, despite my disclaimer #1. Give me a bowl of these and a pitcher of ice water (or two) and I'm a happy camper. It's really the chili sauce that makes this soooo good. The dumplings themselves could be better - with better dough and better meat. But alas, they don't just sell you the chili sauce! 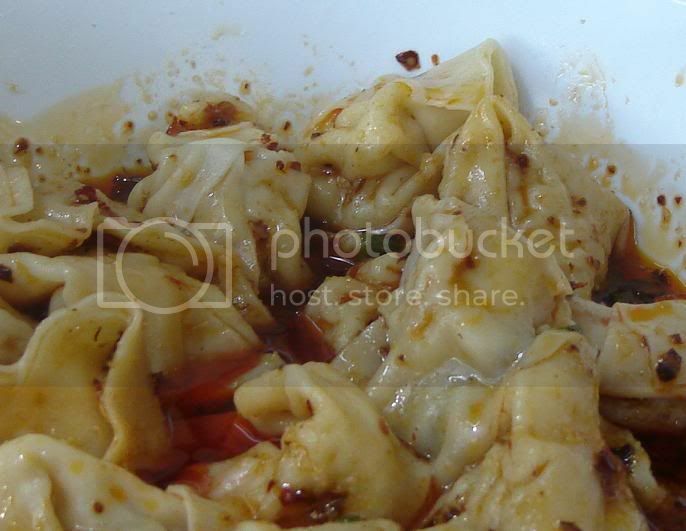 You can try to bring home leftovers and throw the chili sauce with your own homemade dumplings. Mmmmm. Somewhat recently I had the good fortune of meeting Mattatouille and friends, who then introduced me to Tai, the owner of Scoops. I will leave our conversation with Tai for another post. What I wanted to blog about today is what happened after :) Mattatouille's friend (don't want to put her real name here, especially when I may misspell it :P ) suggested we go bar-food hopping in K-town. Being a non-Korean-speaker or reader, this was untested waters for me, and I like these new people I just met, so I took them up on it! This place a complete Korean dive. Well, not that I would know. But with the dark interior, smoky haze from the bbq in the middle, and old movie posters, it sure seemed like it to me. The menu is completely in Korean, so I wasn't sure what we ordered. All I know is that we got these spicy kalbi which were delicious, and were #52 on the menu! Don't know what it's called, but it's #52 my friends! Not that spicy, and extremely addicting. 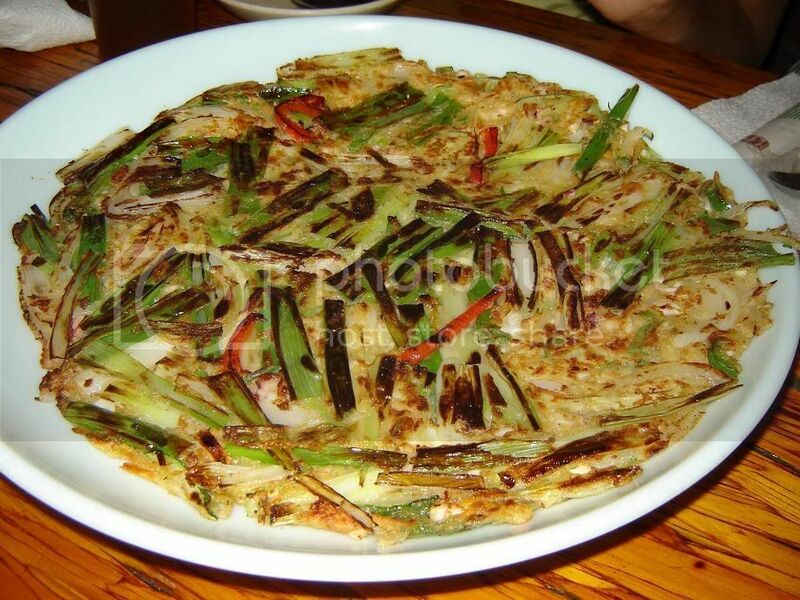 We also got some scallion pancakes (pa jeon? I tried googling it). Somewhat thick, with tons of scallions, and a nice crispy exterior! This segment, with some Hite beer, was ~$10/person total. I wanted some more ribs, but we gotta move on to the next one! This was ... spicy! 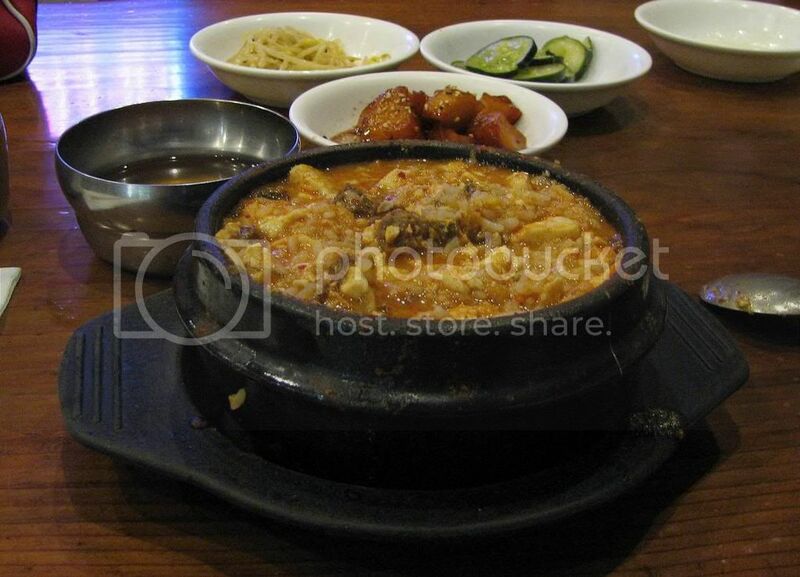 The sauce was deliciously sweet and sticky but also spicy, spicier than the kal bi from dansungsa. I was having trouble eating this and ended up gobbling tons of the marinated turnips. Oh, and drinking a lot of Hite. 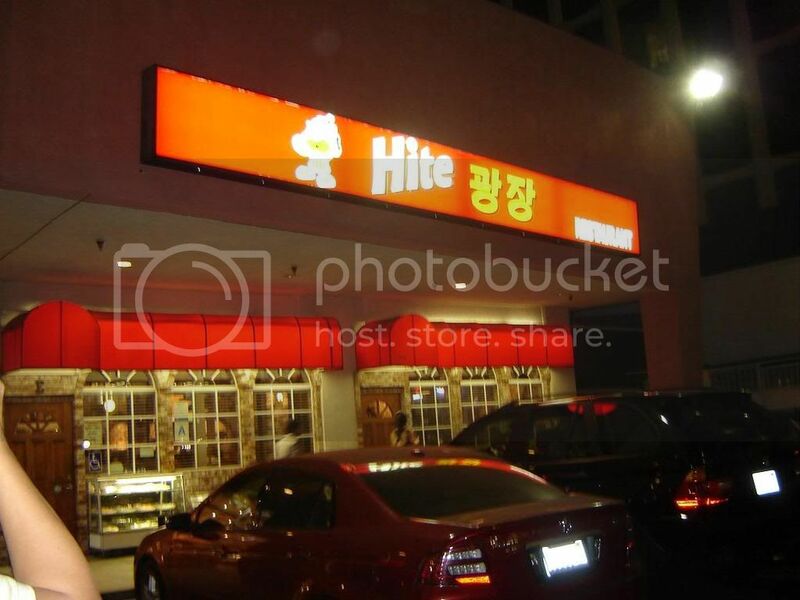 They had a dark, light, and "special" Hite which is just a mix of the two. 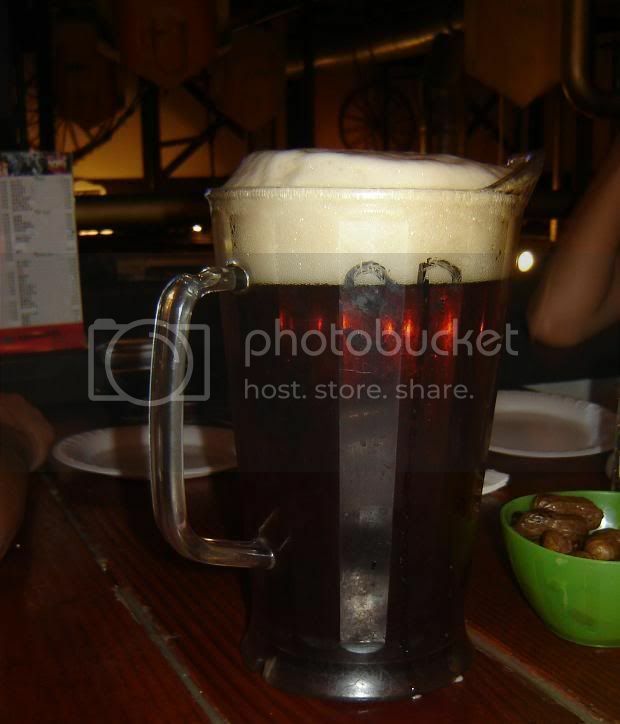 Sounded interesting enough, so we went with a pitcher of that. Not much difference than the regular Hite - still light. 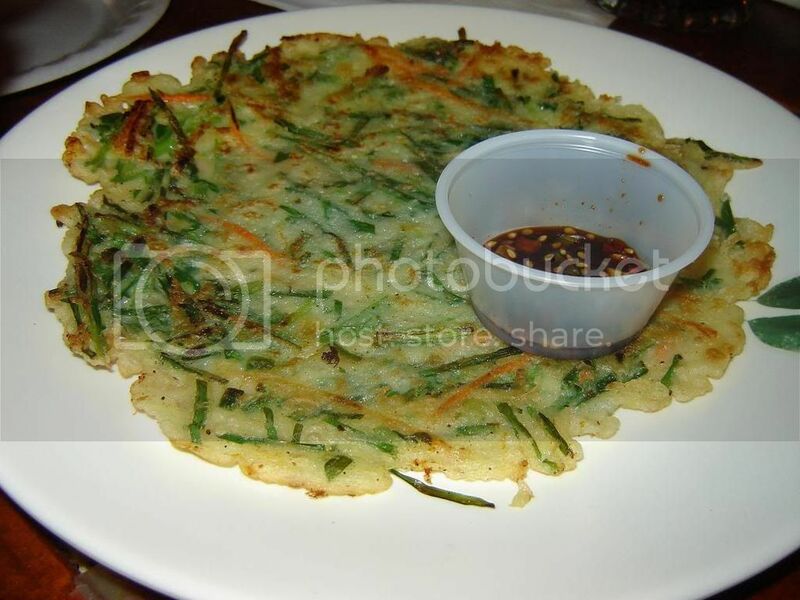 We also got some scallion pancake here, which was served there for free. Thinner and crispier than the previous one, which in a way is better, but I did like the fact that the previous one was more loaded with scallions! Just to get it out there, I CANNOT eat spicy food. Yes, I am Indonesian. Call me weird. Call me weak-sauce. Call me whatever. I just can't handle it. Occasionally though, I will sit through and suffer and drink gallons of water so I can have a particular dish. Soon tofu is one of them. I always ask for Mild, but it ends up too spicy for me anyway. But plain would just be WRONG! 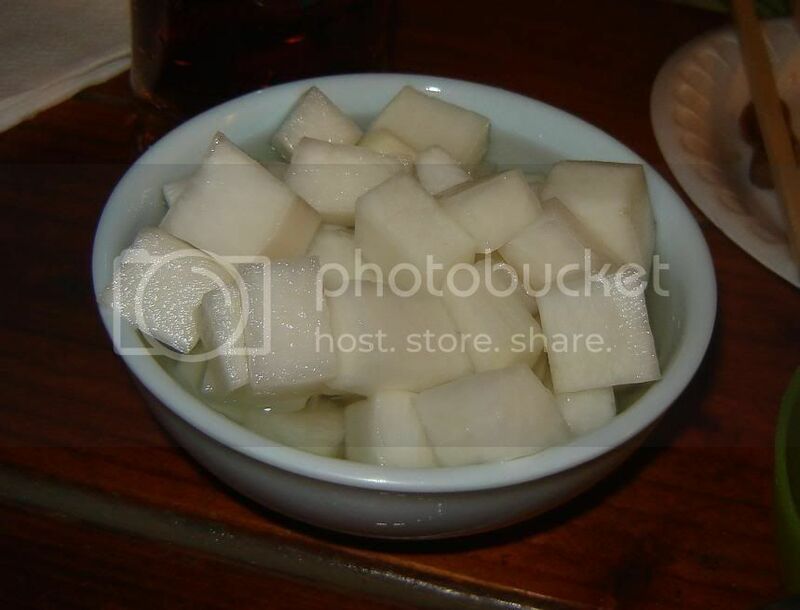 Favorite soon tofu place in LA? That'd be Beverly Soon Tofu. Your meal here starts with the regular and not so regular banchan: a silky smooth tofu with sesame, plus the usual plates of kim chi, bean sprouts, etc. Barley tea is served in metal bowls free of charge. Then the soon tofu comes sizzling hot into which you immediately add an egg, rice, and then mix things up. The ingredients used at Beverly Soon Tofu is higher quality than most and you can taste it, especially in the tofu and meat.